Today, the Franklin Founding Father Commemorative Silver Dollar Coin remembers when Congress read Dr. Franklin’s proposed Articles of Confederation on July 21, 1775. These articles were not approved, however they were the forerunner of the signed Articles of Confederation and of our Constitution. Entered in by the Delegates of the Several Colonies of New Hampshire, Etc., In General Congress. Met at Philadelphia May 10. 1775. The said United Colonies hereby severally enter into a firm League of Friendship with each other, binding [on] themselves and their Posterity, for [their common] Defense against their Enemies, for the Security of their Liberties and Properties, the Safety of their Persons and Families, and their mutual and general Welfare. That each Colony shall enjoy and retain as much as it may think fit of its own present Laws, Customs, Rights, Privileges, and peculiar jurisdictions within its own Limits; and may amend its own Constitution, as shall seem best to its own Assembly or Convention. That for the more convenient Management of general Interests, Delegates shall be annually elected in each Colony, to meet in General Congress at such Time and Place as shall be agreed on in the next preceding Congress. Only, where particular Circumstances do not make a Duration necessary, it is understood to be a Rule, that each succeeding Congress be held in a different Colony, till the whole Number be gone through; and so in perpetual Rotation; and that accordingly the next [Congress] after the present shall be held at Annapolis, in Maryland. That the Power and Duty of the Congress shall extend to the Determining on War and Peace; the entering into Alliances, [sending and receiving ambassadors] (the reconciliation with Great Britain); the settling all Disputes and Differences between Colony and Colony, [about Limits or any other cause,] if such should arise; and the Planting of new Colonies; when proper. The Congress shall also make such general [ordinances] as, though necessary to the General Welfare, particular Assemblies cannot be competent to, viz. [those that may relate to our general] Commerce, or general Currency; the establishment of Posts; [and] the Regulation of [our common] Forces. The Congress shall also have the appointment of all General Officers, civil and military, appertaining to the general Confederacy, such as General Treasurer, Secretary, &c.
All Charges of Wars, and all other general Expenses [to be] incurred for the common Welfare, shall be defrayed out of a common Treasury, which is to be supplied by each Colony in proportion to its Number of Male Polls between 16 and 60 Years of Age; the Taxes for paying that Proportion [are] to be laid and levied by [the] Laws of each Colony. The Number of Delegates to be elected and sent to the Congress by each Colony shall be regulated, from time to time, by the Number of [such] Polls returned; so as that one Delegate be allowed for every 5000 Polls. And the Delegates are to bring with them to every Congress an authenticated return of the number of Polls in their respective Provinces, [which is] to be triennially/annually taken for the Purposes above mentioned. At every Meeting of the Congress, one half of the Members returned, exclusive of Proxies, be necessary to make a Quorum; and each Delegate at the Congress shall have a Vote in all Cases, and, if necessarily absent, shall be allowed to appoint [any other Delegate from the same Colony to be his] Proxy, who may vote for him. An executive Council shall be appointed by the Congress [out of their own Body,] consisting of 12 Persons; of whom, in the first appointment, [one third, viz.] (four,) shall be for one Year, (four) for two Years, and (four) for three Years; and as the said terms expire, the Vacancies shall be filled by appointments for three Years; whereby one Third of the Members will be changed annually. And each Person who has served the said Term [of three Years] as Counselor, shall have a Respite of three Years, before he can be elected again. This Council, [of whom two thirds shall be a Quorum] in the Recess of Congress, is to execute what shall have been enjoined thereby; [to] manage the general [Continental] Business and Interests; to receive applications from foreign Countries; [to] prepare Matters for the Consideration of the Congress; to fill up, [pro tempore,] [continental] offices, that fall vacant; and to draw on the General Treasurer for such Monies as may be necessary for general Services, and appropriated by the Congress to such Services. A perpetual Alliance, offensive and defensive, is to be entered into as soon as may be with the Six Nations; their Limits to be ascertained and secured to them; their Land not to be encroached on, nor any private [or Colony] Purchases made of them hereafter to be held good; nor any [Contract for Lands] to be made, but between the Great Council [of the Indians] at Onondaga and the General Congress. The Boundaries and Lands of all the other Indians shall also be [ascertained and] secured to them [in the same manner,] and Persons appointed to reside among them in proper Districts; who shall take care to prevent Injustice in the Trade with them; [and be enabled at our general Expense,] by occasional small supplies, to relieve their personal Wants and Distresses. And all Purchases from them shall be by the Congress, for the General Advantage and Benefit of the United Colonies. As all new Institutions may have Imperfections, which only Time and Experience can discover, it is agreed, that the General Congress, from time [to time,] shall propose such amendments of the Constitution as may be found necessary; which, being approved by a Majority of the Colony Assemblies, shall be equally binding with the rest of the Articles of this Confederation. Any and every Colony from Great Britain [upon the continent of North America,] not at present engaged in our Association, may, upon application [and joining the said Association,] be received into the Confederation, viz. [Ireland,] the West India Islands, Quebec, St. John’s, Nova Scotia, Bermudas, and the East and West Floridas; and shall [thereupon] be entitled to all the advantages of our Union, mutual Assistance, and Commerce. These Articles shall be proposed to the several Provincial Conventions or Assemblies, to be by them considered; and if approved, they are advised to empower their Delegates to agree to and ratify the same in the ensuing Congress. After which the Union thereby established is to continue firm, till the Terms of Reconciliation proposed in the Petition of the last Congress to the King are agreed to; till the Acts since made, restraining the American Commerce [and Fisheries,] are repealed; till Reparation is made for the Injury done to Boston, by shutting up its Port, for the Burning of Charlestown, and for the Expense of this unjust War; and till all the British Troops are withdrawn from America. On the Arrival of these Events, the Colonies return to their former Connection and Friendship with Britain: But on Failure thereof, this Confederation is to be perpetual. Read before Congress July 21, 1775. 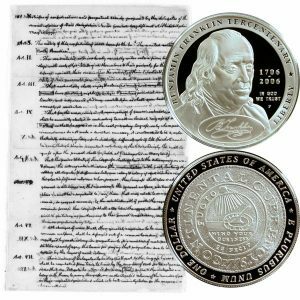 The Franklin Founding Father Commemorative Silver Dollar Coin shows with an image of one of Thomas Jefferson’s edited pages of Franklin’s original Articles of Confederation.